Andrew Fraknoi has a display of astronomy humor bumper stickers on his Facebook page. I have a gallery of Astronomy Cake photos on Flickr. 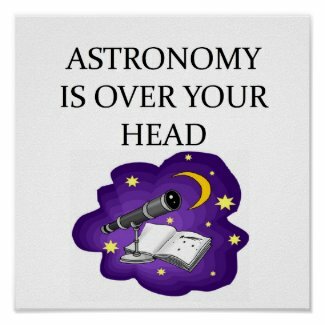 Click here for astronomy humor images you can purchase. it was nicknamed "Snickers" because, compared to our galaxy, it was just a peanut. Source: Astronomy in the Marketplace (1987) Used with permission. One of several video versions. Click here to read the lyrics on www.MontyPython.net website. Astronomy isn't relevant, its irrelevant on according to NASA. See Wikipedia article on this video podcast series produced by NASA's Spitzer Space Telescope. T-shirt available from Neatoshop - design by Chris Murphy. The website's slogan is: "A web site for the astronomically disadvantaged." It has an 'Ask the Astronomer' section with answers to over 2000 questions. Some of the most ridiculous astronomy questions asked on Yahoo. Inertia makes the world go round. Gravity isn't easy, but it's the law. How far can you see on a clear day? 93 million miles — from here to the Sun. What do human faces have in common with the moon ? They are both not symmetrical. What is the difference between the 2008 and 2012 Obama presidential campaign? In 2008 he promised the voters the full moon and in 2012 he is promising a quarter moon. What kind of government would restore democracy in the solar system? What did Lady McBeth say when she was on Jupiter? What planet is found on a table? Mercury - it is part of the scientific table. What did the Martian order at the bar? What did the Martian drink at breakfast? 1. What has a dark side and a light side, and holds the universe together? 2. What are all around and made invisible by sunlight? 3. What lives above a star, but does not burn and has 11 friends that do not turn? 4. The higher it climbs the hotter it gets! What is it? 5. Where is a place where yesterday always follows today? 6. 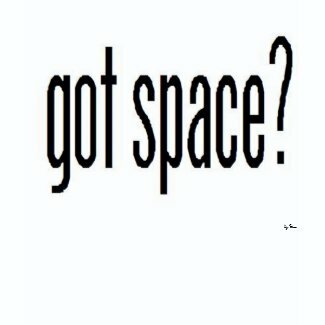 What did the astronaut say when asked his opinion of the asteroids? 7. What holds up the moon? 8. You feed it, it lives, you give it something to drink, it dies. What is it? 9. It passes before the sun and makes no shadow. 10. What is the beginning of eternity, the end of time and space, the beginning of every end, the end of every place. 3) The number 7 on a touch-tone phone.